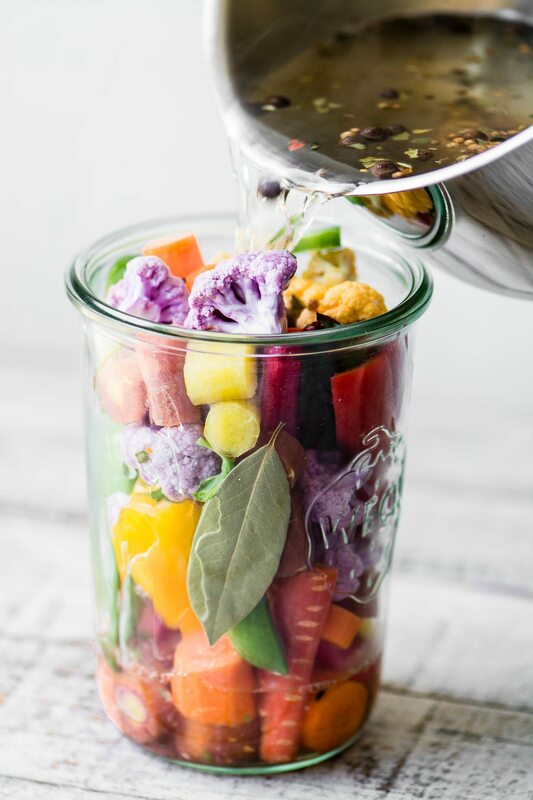 My Quick Rainbow Giardiniera is a colorful riff on the classic Italian relish ~ my vibrant version makes use of some of the more unique veggies in the produce aisle. 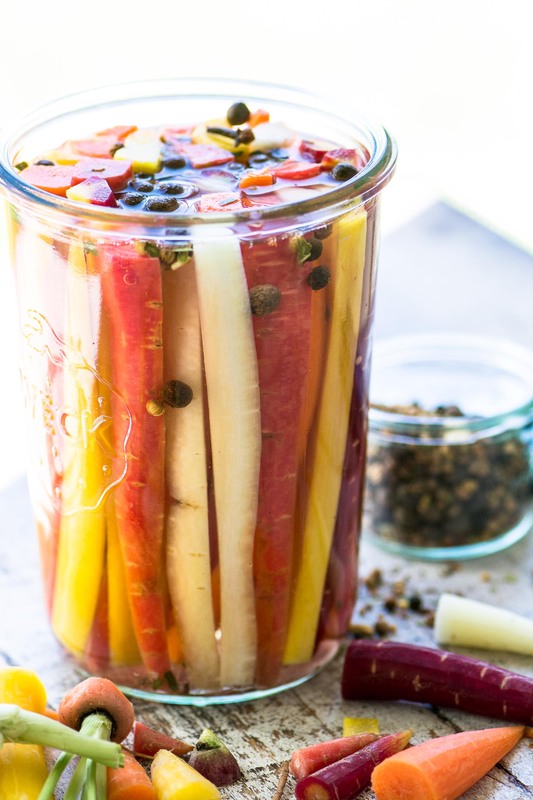 Enjoy these crunchy pickled vegetables as a healthy snack or side dish, use them in antipasto platters, salads, and pastas, too. Serve them with burgers, dogs, brats, sandwiches, you name it, giardiniera goes with just about everything. 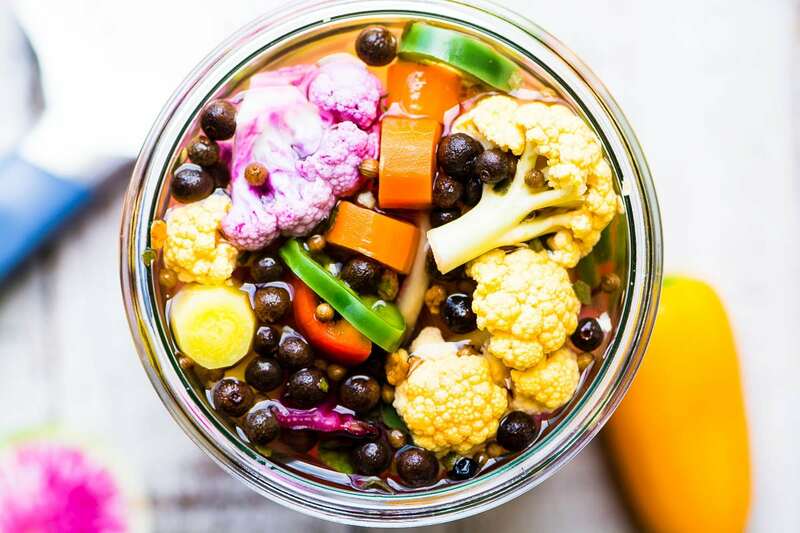 Giardiniera (Jar-dih-NAIR-ah) is an Italian relish made from assorted pickled vegetables from the garden, traditionally carrots, celery, peppers, and cauliflower. It usually has a little heat to it, either from fresh hot peppers or red pepper flakes. 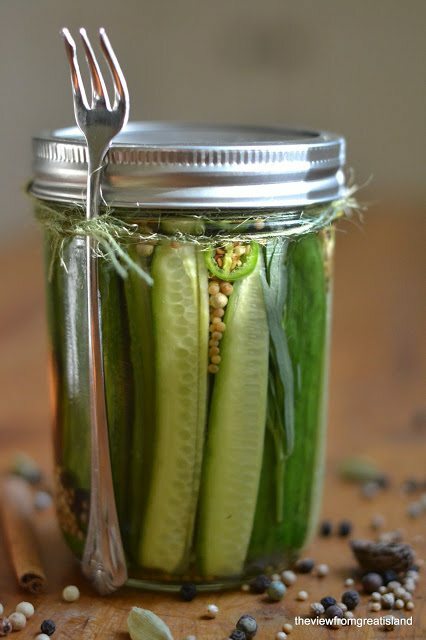 I love this recipe because you can make a quick giardiniera pickle out of whatever’s in the crisper drawer, or in your garden. The more colorful and random the assortment the better if you ask me! Also try baby squash, jicama, asparagus, green or yellow beans, beets, etc. 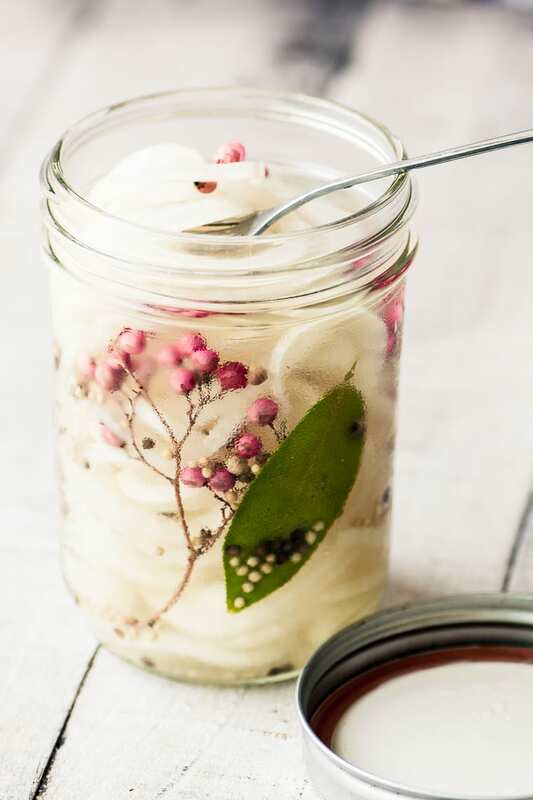 Fit your veggies into a large canning jar, it’s kind of like a puzzle, fit them in as tightly as you can. Everything should be bite sized, or thereabouts. I will sometimes put small peppers in whole, stem and all. Your giardiniera will be ready to snack on in 24 hours, and the veggies will be super crisp. 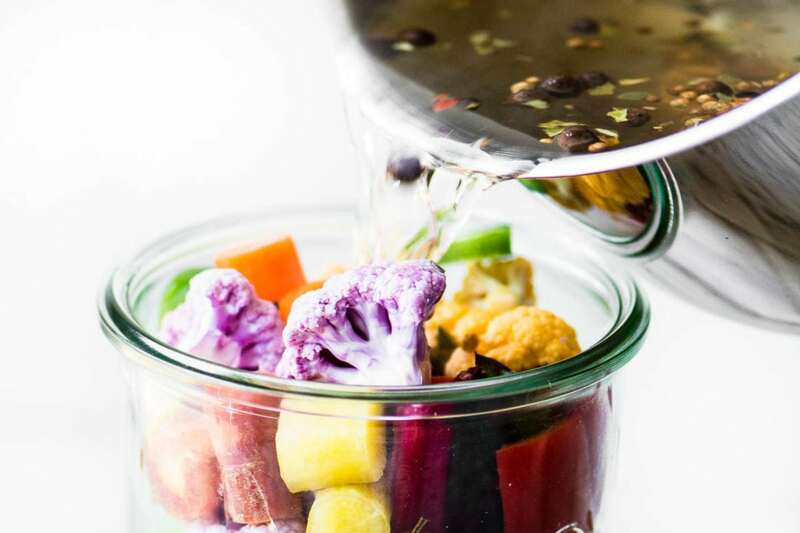 If you want to achieve the more traditional giardiniera texture you will cook the vegetables very briefly in the brine before filling the jar. The pickles will keep for a month or more in the refrigerator, just make sure the veggies are completely submerged in the brine. 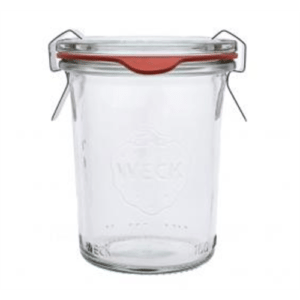 I absolutely love these German manufactured glass canning jars…they come in all shapes and sizes and I use them for everything from homemade yogurt to pantry storage. The smaller sizes make the perfect jars for gifting homemade jams and jellies, etc. 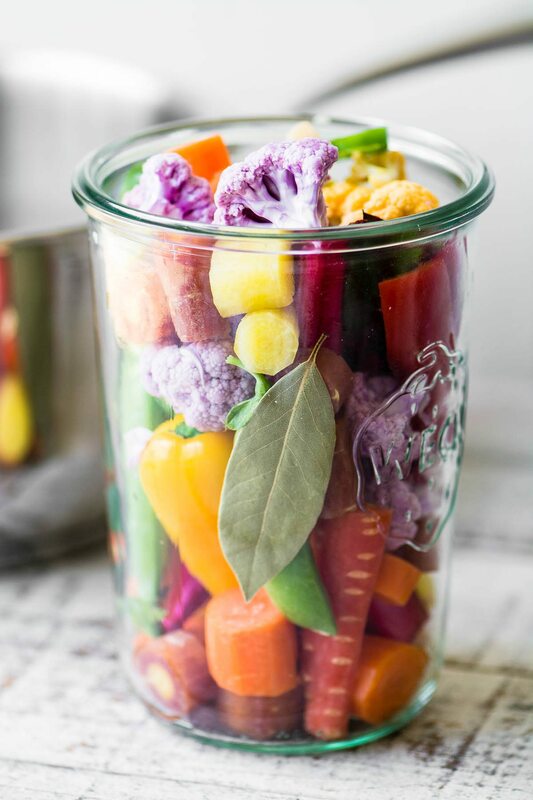 Fit your vegetables into a large mason jar, or jars. Fit them in as tightly as you can. Heat the vinegar, water, and spices in a small saucepan just until it comes to a simmer. 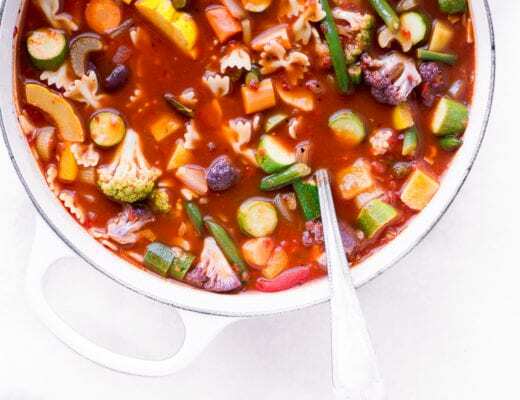 Let the mixture cool slightly, then pour over the vegetables, making sure to cover them completely with liquid. 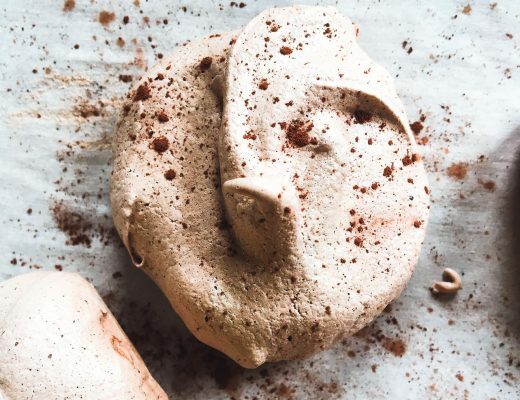 Let cool to room temperature, then cap and refrigerate for 24 hours before enjoying. Will keep up to a month in the refrigerator as long as the vegetables are submerged in the brine. Make it sweeter ~ add a tablespoon of sugar to the brine. Make it mild ~ leave out the hot chilies. 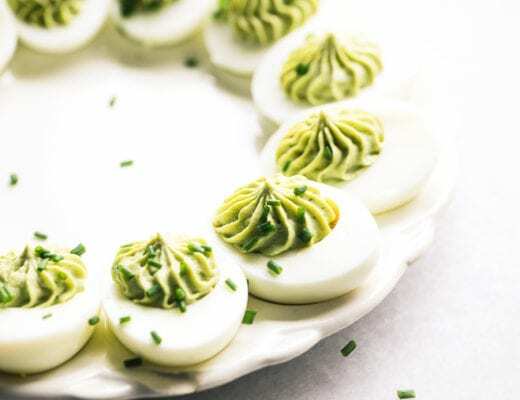 Make it with olive oil ~ substitute olive oil for the water for a richer pickle. I love picked vegetables. They’re so good on everything! These are beautiful and colorful and fun! Oh yes please. Your pickles look delightful. Love all the different colours and flavours, though I’ve no idea what watermelon radishes are. Watermelon radishes are radishes about the size of small turnips, and they are the most amazing bright pink inside, with a green ‘rind’, so they look like watermelons when sliced. Gorgeous rainbow colours…and I am sure these pickles are very tasty.